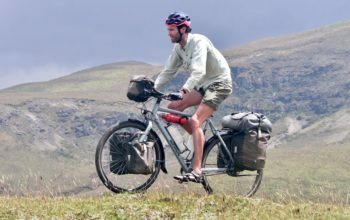 Visas are a nightmare, especially for Central Asia, so let us ease the pain for your next adventure along the Silk Road. Keep in mind we are both Australians, so the below prices, duration of stay and letters of invitation requirements may not be the same for you. Available at the Turkish border for most nationalities. Australians pay 45€ each for a 90 day multi-entry visa. Almost every other country in the world pays far less, but word on the street is that the high price is a retaliation to a recent price increase for any Turkish person visiting Australia. We did not need any passport photos or photocopies. We entered via the Ipsala border and it took roughly 30 minutes to cross with no complications. Available at the border and valid for a year. We thought that we would have to pay 50 lari ($30US) each to enter but we walked though with a stamp and our money in our pockets. We entered via the Sarpi border and it took roughly 30 minutes to cross with no complications. We’d heard that we need a letter of invitation (LOI), local contacts and roughly about a million bits of private information to get into Azerbaijan. We picked up some visa application forms in Batumi, Georgia in the morning and were told to come back at 2pm with everything filled out. We rocked up at 2pm and were told to wait ten minutes outside by the security guard. This would not normally be a problem, but it was only 4 degrees and raining, so we were wet and COLD! 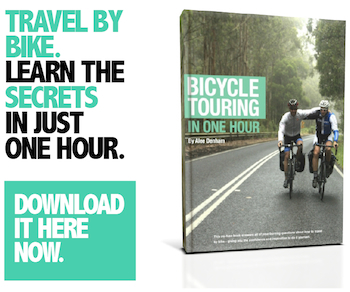 The ten minutes turned into 50 minutes, which we weren’t so happy about – but what can you do. Upon entering, we realised there was no waiting space inside (hence waiting outside) and the embassy was nothing more than a room. We were greeted by a very friendly official who spoke English very well. He asked us a bit about our trip, grabbed the necessary information from our forms for his computer, photocopied and stapled a whole heap of things and wrote up our visa ON THE SPOT! We didn’t even see him look through our application forms. We couldn’t believe it. The cost was $60US for Australians. One month visa. Single entry. We chose the dates between which the visa is valid. We entered via the Lagodekhi border and it took roughly 30 minutes to cross with no complications. For Australians this visa isn’t the most straight forward. It was essential for us to have “letter of invitation”, also known as “visa code”, in order to even apply for a visa. This essentially gives the government three weeks or more to check over our passport and private information, allowing them to pre-approve our visa. Alex’s took three weeks to process and Kat’s five weeks: get on top of this early. We organised this through Let’s Go Iran for a fee of $49US. We’ve heard a few people complain about Let’s Go Iran’s service and drawn out LOI time, so we would recommend using Stan Tours, based on our good experience with them for other LOIs. We had heard that the embassy in Trabzon, Turkey are more lenient, fast and friendly in regard to visas, so we chose to do it there. We found out that even in Trabzon, it is ESSENTIAL for Australians to have the “visa code”. The embassy was able to arrange this if you are prepared to wait two or more weeks. Our visas were effectively completed the same day as we applied (we had to wait one day because of a public holiday). We had to provide all fingerprints and filled out a form for the police before we could get our visa. The cost was 105€ each for Australians (cheaper for most other countries). One month visa. Single entry. Valid anytime within three months of issue. 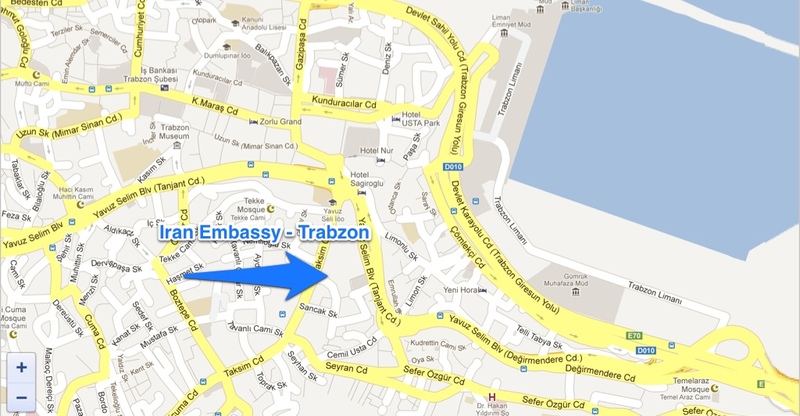 Address of Iran Embassy (Iran Consulate): 3 Taksim Caddesi Kiziltoprak Sokak, Trabzon. Phone: (+90) (462) 326 76 51. Documents required: 2x filled out visa application form, 2x passport copy, 2x passport photo (note: ladies must have their hair covered! ), 1x visa code. We entered via the Astara border and it took about two hours to cross. 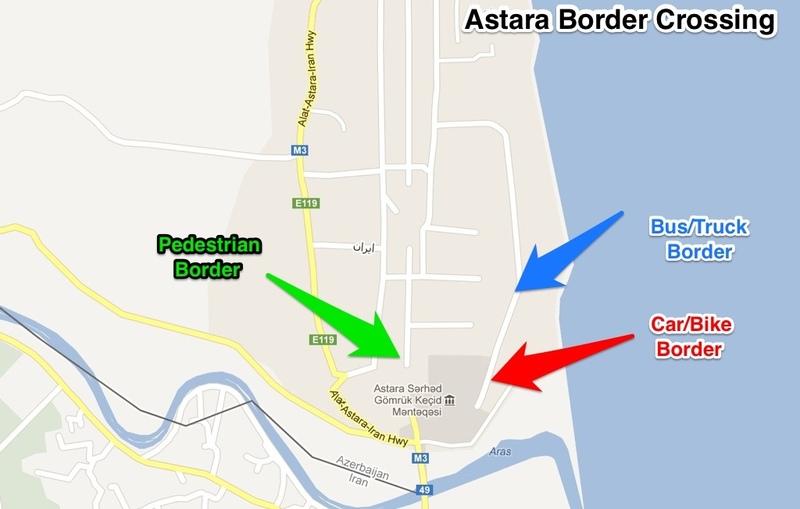 Crossing at Astara (Azerbaijan) was both confusing and time consuming. There are three different gates to enter through: one for pedestrians, one for buses/trucks and one for cars. The border also closes for a few hours around lunch time. We started at the pedestrian gate, but got told to go to the truck gates, but that was later changed to the car gates. Apart from working out which gate to go through and who to talk to, leaving Azerbaijan was not a problem. When we got to Iran, we were told to go through the pedestrian gate. Our passports were embarrassingly taken to the front of the queue and we were waved through. We were then taken to speak to the police chief who asked us a few questions about our travels and our employment in Australia. The officer was kind and we spent time talking about Iran and were helped with some language (which added another 30minutes to our border time). We were given the green light and were in Iran! You will see lots of money changers at the border – avoid changing money with them because they will give you a terrible rate (we lost almost half our money to them – only a few dollars though). It is best to go with a local person you trust to the money exchange to get the best rate. Note: In May 2013 you get $1USD=35000 rial and 1€=45000 rial. The official government exchange rate is $1USD=12500 rial, you don’t want this! 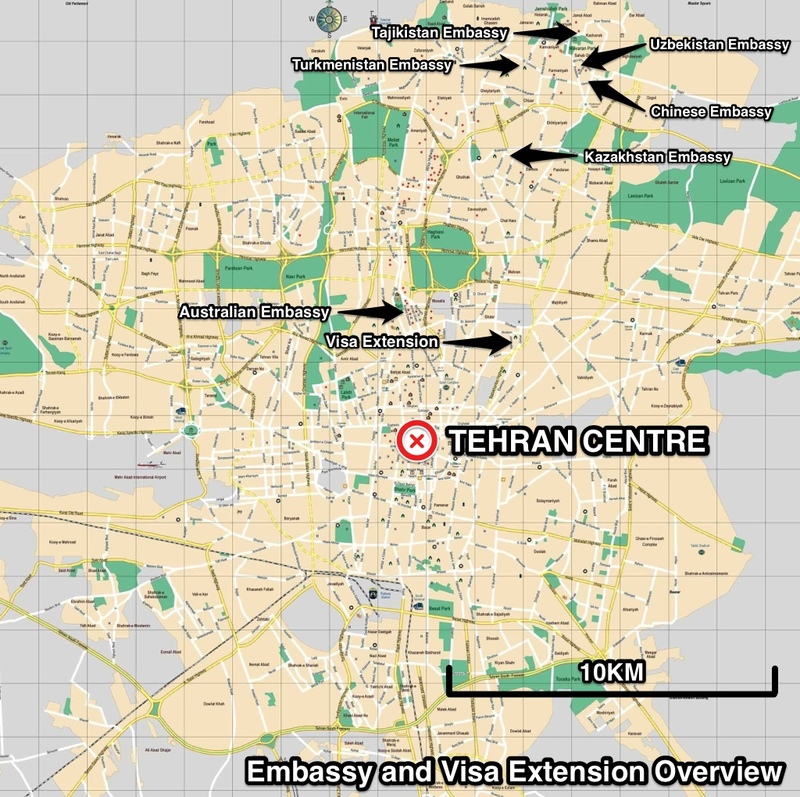 It is possible to extend your Iranian visa 2-3 times at 30 extra days per extension. You can do this at the Department of ‘Alien Affairs’ (teehee!) in Tehran, Shiraz, Yazd, Esfahan and Tabriz. Shiraz is the BEST city we heard from others to extend visas – within 30 minutes we had an extra month to get about. Comparing this to Tehran, they told us it would take 10 days and we’ve heard of everything from 5-10 days at the other city offices. If you have a REALLY good reason to get an extension on the spot, it is possible in Tehran. 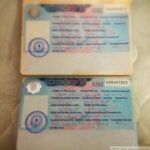 Our friends managed to extend their visa on the spot, but they needed only 5-days to link up an unexpectedly short Turkmenistan visa. You will need to pay a nearby Melli Bank 300,000 rial for the extension. Get the bank numbers first from the alien affairs office, and after paying the bank come back with the bank slip. Our office official filled in the application form for us, but other offices might not be so kind. We’ve heard that you can photocopy and get passport photos taken at the alien affairs office in Tehran for a price. Once your paperwork is all stapled together, the office manager will then sign off on your application either on the spot, or on a particular day. Documents required: 1x b&w passport copy, 1x b&w Iran visa copy, 2x passport photo. Cost: 300,000 rial ($9USD) per person, 10000 rial (30c) for the folder at the Alien Affairs office. Without being on an organised tour, the longest visa most people can get is a 5-day transit visa. If you are unlucky like our friends Will & Selina, you will get as little as 3-days. 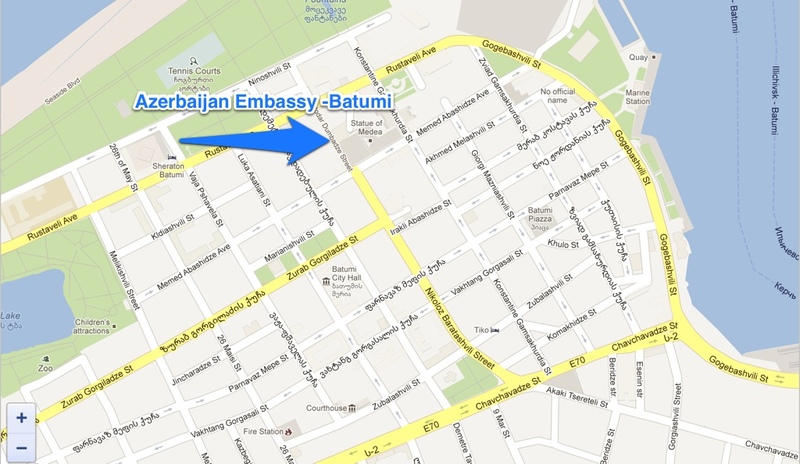 We arrived at the Turkmenistan embassy with our COLOUR copies (don’t think of trying b&w) of the required information. There are three stairs up to a 30x30cm window where you will speak to the embassy official and these stairs are madness. Queues don’t exist at this embassy, so stand your ground and get your strategic placement on. You will first need to get an application form, sometimes someone at the front of the line will get one for you before submitting their application. Ask for a plain piece of paper as well to complete the hand written ‘application letter’ (see below). Ask around for a glue stick and stick your photo to the top right of the form. Once you’ve completed these, shove your way to the window and the official will tell you to come back in 5-days. A total time of ~1h. After 5-days (well, we actually took two weeks) we were back. We had to fill in another visa application form (different to the first one) and attach a photo of our fine looking selves. After submitting we were told to wait a while. “Australia” was yelled out of the window after 20 minutes and we were asked to pay for our visas. Finally, 30 minutes after paying we received our passports, visa included! 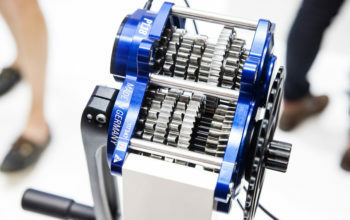 A total time of ~1.5h. Hours: 9:00-11:00 Monday to Thursday, 9:30-11:30am Sunday. When you come to pick up the visa you need: 1x final application form (available at embassy) and 1x passport photo. Cost: $55USD each – the bills need to be unfolded and unmarked, lots of people get turned away with bills that are not 100% perfect. We entered Turkmenistan via the Iran-Sarakhs border. The border road is the first right as you ride into town, with a big hotel on the corner. 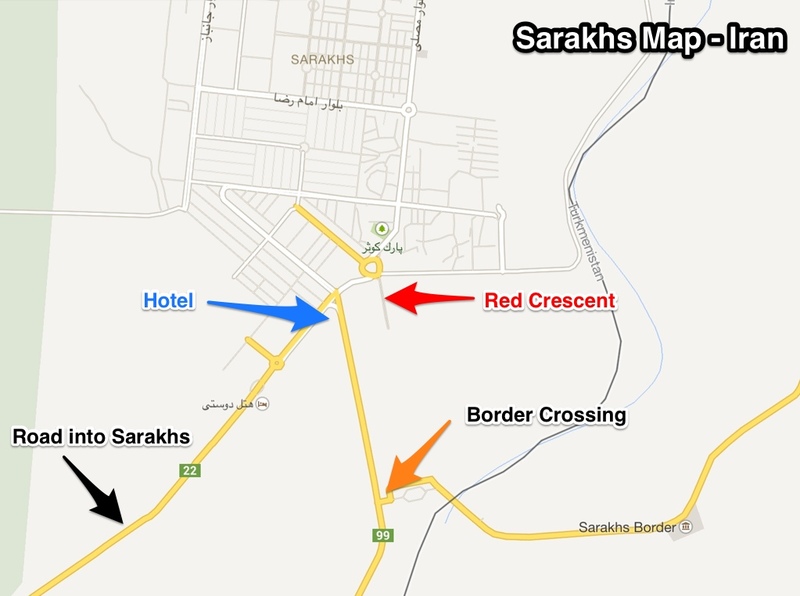 If you’re looking for accommodation, this hotel isn’t too expensive and the food decent, however the Red Cresent is more than happy to take tourists in, and won’t charge you a cent (see map below). 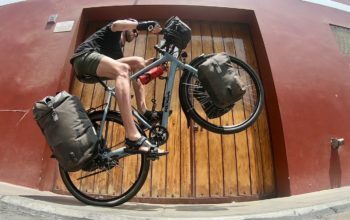 They told us to tell every bicycle tourer we know to knock on their door (or gate) and the right people in town will arrive and help you with anything you need! Super friendly. Everything went smooth on the Iran part of the border. 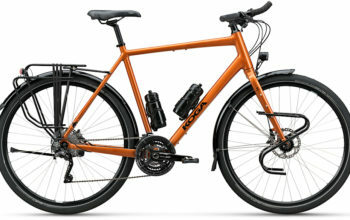 You will be able to ride up and leave your bike outside the building while you get an exit stamp. 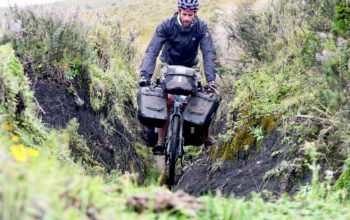 A customs officer did a very lazy check of all of our bags on the bike, but we were out within 15 minutes and riding the rough road to Turkmenistan. The Turkmenistan side of the border was a little different. We spoke to the doctor for a few minutes, who when we told him we were from Australia, exclaimed “Penguin!“. “Err… yes, we have them I guess” we mumbled back. We then handed our passports over and were told to wait. After ONE hour, we asked whether there was a problem. The only English speaking officer told us that it shouldn’t be long. By TWO hours waiting, the temperature had soared to the mid-40s and was getting windy… and dusty! The officer now mentioned that they were waiting for a phone call. We wondered if we were meant to be paying a bribe to get through fast, but no one had made it obvious to us if this was the case. After waiting for FOUR hours, and after we’d eating all of our snacks and had taken a big chunk out of our water supply. The English speaking officer felt sorry for us and brought us potato somsas for lunch, making us think that a bribe wouldn’t have made getting through any quicker. Finally, after SIX hours we were told we could go through. The officers wanted to go through everything we had at this stage, going especially slowly through our medical bag and accusing us of having narcotics over and over. Unfortunately these SIX hours at the border had taken a really big chunk out of our 5-day visa, sending us out at the hottest part of the day, but what can you do?! For Kat’s more creative and elaborate recount of the border crossing, read our Turkmenistan diary HERE. 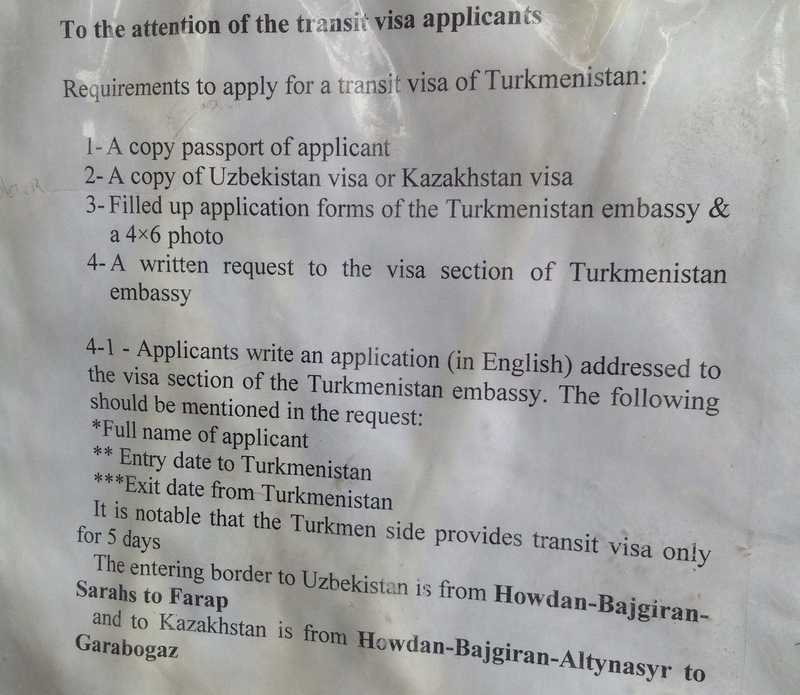 The Uzbekistan visa will most likely be the first visa you apply for in Tehran. We arrived early to the Uzbekistan Embassy, 30 minutes in fact, however by open time we were surprised no-one was there. Turns out the internet address we had was outdated and we were directed to its actual location one kilometre away. Don’t make the same mistake as us, check our map above! The Uzbekistan embassy has a queuing list at the door for you to write your name on. Visa agents with hundreds of applications arrive at 8:30am to put their name down early, then come back at 10:00-11:00am when they know they can waltz in without waiting a second. We recommend getting in early, writing your name down first and waiting until the doors open at 9:00am. Bring your filled in application form and copies of everything (2x) with you because you can’t do any of this at the embassy. We recommend using an agency to provide a letter of invitation – we used Stan Tours which took us about a week to make everything happen at $40USD per person. We were able to pick up our visa within an hour with this information, others without this were waiting two or more weeks for a visa. 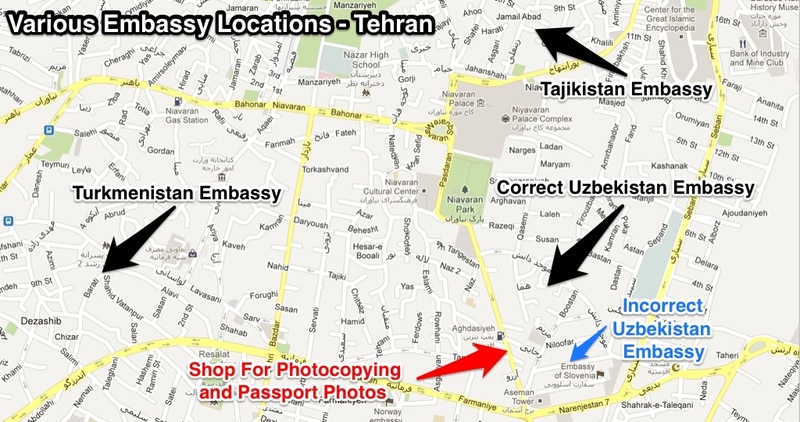 Copying (get a couple of colour and b&w) and passport photos can be done nearby the Uzbekistan Embassy (see map above) and will be useful for your other visas and Iran visa extension. Hours: 9:00-11:00am Sunday to Thursday. Documents required: 2x visa application form (embassy will not provide this, we had ours filled in by Stan Tours), 2x passport page copy (b&w), 2x passport photos, 1x letter of invitation. Cost: $75 USD per person. We crossed from Turkmenistan to Uzbekistan via the Farap border crossing. The rough road from Turkmenabat to the border is about 40km despite looking very close on a map. It is not that easy to find your way to Farab from Turkmenabat, as there is absolutely no signage or main road making the way obvious. 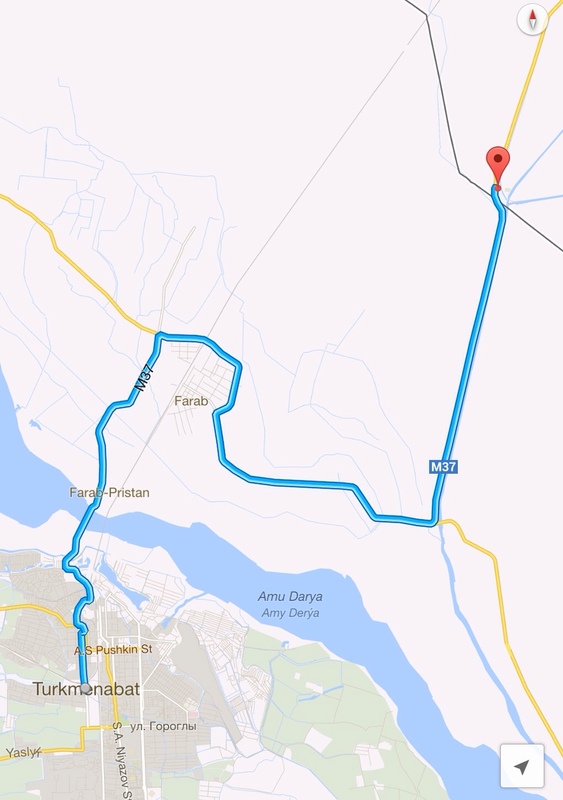 Ask around to get to Farab, then continue riding until you hit the river. You’ll need to take the west bank north along the river to the border. To make this easy for you, check out our below map for the route. We changed our Turkmen som at the border for a pretty average rate. We later found out that the black market rate in Uzbekistan is $1 USD to 2700 Uzbek som (June 2013). Getting out of Turkmenistan took only 15 minutes, nothing like the disaster that was entering. The Uzbek side of the border was quite smooth also. We had to fill in many forms in Russian, but were luckily helped by an officer who could translate the data fields for us. We declared how much money we had in our panniers (nothing was checked) and were told to hold onto the papers for when we departed. A bunch of ladies pushed us embarrassingly to the front of the next queue to get our stamps. We were in and out of the Uzbek border control in 45 minutes or so. Lots of people talk about your registration at hotels, but nobody (including the police) knows the precise laws binding this. We heard a few different things during our stay: from the German embassy that you only need to register if you are in one place for more than three days, from most other travellers that you should not go more than three days without getting registered somewhere. Be careful about where you stay if you are seeking registration, some hotels do not have the appropriate licences to provide this to you, make sure you insist that you need it. In the end, our registration was checked through closely at only one police checkpoint and wasn’t even asked for at the border out of Uzbekistan! Was going to be obtained in Tehran, Iran. 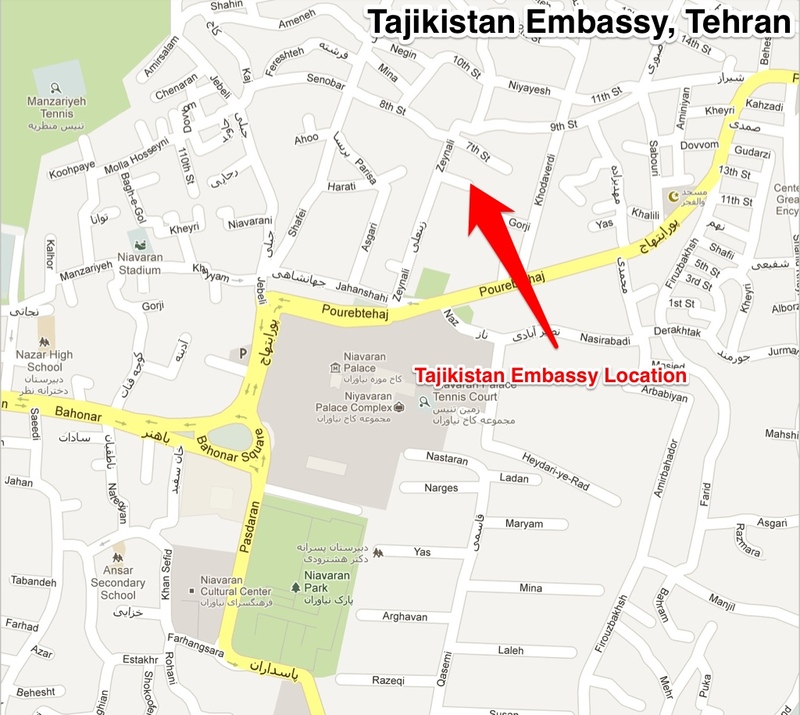 The Tajikistan embassy is hidden down a side street and is somewhat hard to find. Similar to the Turkmenistan embassy, it is just a 30x30cm window connected to an office with no queuing required. You can pick up an application form there. Unlike the other ‘Stans, a letter of invitation is not required, however most travellers will need to bring a ‘letter of recommendation’ from your own embassy. Our letters were obtained for a cost of 25€ each. Update 1st June 2013 – It seems that the rules have changed overnight and we cannot get a visa in Iran despite having the letters of recommendation! There now needs to be government approval (ie. Letter of Invitation) from Tajikistan before they will let many nationalities in. If only we arrived one day earlier!!! 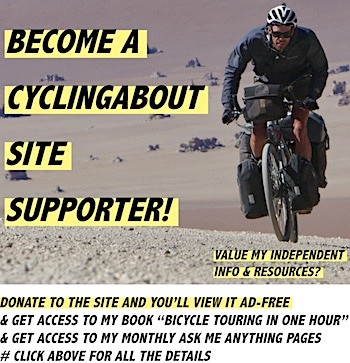 We have now decided we will not be riding through Tajikistan. Documents required: 1x visa application form, 1x passport page copy, 1x letter of invitation, 1x letter of recommendation, 1x passport photo. Obtained at the Uchkurgan border crossing. Kyrgyzstan is the easiest country to visit in Central Asia for most foreigners (you should check if your nationality requires one). For Australians, the visa is available at all borders at no charge and is valid for up to 60 days. You do not need any passport photos or photocopies to obtain a visa. The new Uchkurgan border is 10km further down the road for both the Uzbek and Kyrgyz sides; please have a look at our map below for the way there. As of July 2013, the border on the Uzbek side was a construction site full of labourers and the odd official. The experience was all pretty casual, we were never checked for hotel registration or the amount of money we had, and the entire process took 30 minutes to get our exit stamp. We recommend changing your Uzbekistan soms before this border because it is really hard to find money changers in Kyrgyzstan that deal with this currency. Try and get rid of them at the bazaar in the big Uzbek city of Namangan. The Kyrgyz side was unbelievably casual. Just two caravans, a boom gate and five officials. We were in within 15 minutes and were then made chai by one of the lovely border guys! So incredibly relaxing and easy compared to every border we’ve had since Western Europe!